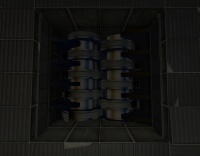 The Shredder is a large pair of spinning blades used to shred Aperture Science equipment. It was first seen in The Escape, where the blades destroy turrets the systems deems to be defective. Wheatley tried to use a pair to kill Chell in The Part Where He Kills You after she maneuvered past his turrets. The player must move to the left or the right to avoid. It also appears in several Co-op chapter 4 chambers as a hazard. This page was last modified on 20 December 2016, at 08:35.